HI Portland - Northwest i Portland, USA: Reservér nu! We are centrally located in Portland's historic and vibrant Northwest/Nob Hill district with cafes, shops, brew pubs, theatres, galleries, and nightlife. 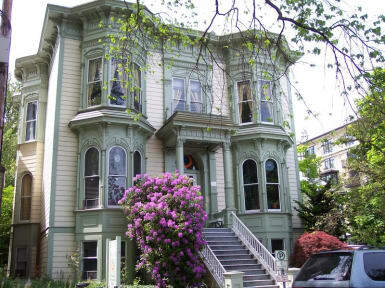 You can walk to downtown, Amtrak/Greyhound, Washington Park (Rose Garden, Japanese Garden), Powell's City of Books, Saturday Market (& Sundays too), farmers' markets, museums, the Pearl arts district, Chinatown and more. The Mission Brew Pub Theater (cheap movies) is only one block away. Nearby Forest Park, the country's largest urban wilderness, offers great hiking and biking. If you are tired of walking, catch the streetcar or MAX. The airport MAX train stops 5 short blocks away from the hostel - get off at Providence Park Station. Please Note: We have 24 hour front desk reception. The dorms are ready at 3pm the day of your reservation. We have a luggage storage room if you arrive before then. No added membership fees! We are an independently operated hostel, licensed by Hostelling International USA. HI Membership is not required at independently operated hostels. Please note that as a hostel intended for travelers, we are unable to accommodate residents of the Portland/Vancouver Metro area. Government-issued ID showing residence outside of this area is required upon check-in. Lodging tax of 15.3% will be added to all overnight fees on arrival. 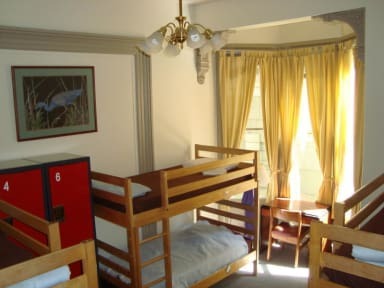 The hostel features dorms and private rooms, outdoor gardens and courtyard with BBQ, kitchen and dining room, common areas, laundry facilities, Internet kiosk, free local phone calls, free wireless internet for laptops, free in-room lockers, free luggage storage, on-street parking for only $5 per day and free artisan breads. Registered guests have 24 hour access.